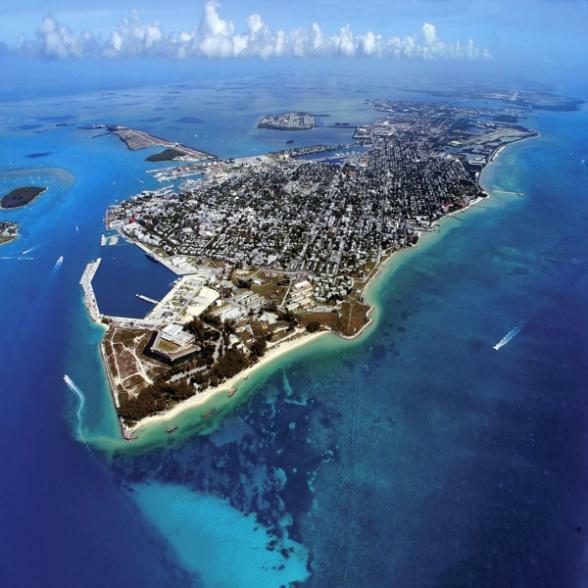 Key West is also known as the Last Resort, the Southernmost Point in the continental U.S. Key West is whatever you want it to be. You can hide out in a tucked away guesthouse, walk the beach and watch a beautiful sunset, or dance all night and peruse Duval Street in downtown Key West. Here you will discover a place where real estate titles date back to the Kings of Spain. Stroll the palm-lined streets and walk in the footsteps of Thomas Edison, Harry Truman and Tennessee Williams. But Key West is forever linked to Ernest Hemingway and the Hemingway Home and Museum in the heart of Old Town celebrates the life and writing of this long time resident. Gaze at the fabled treasure of the galleon Atocha or discover tomorrow's art treasures by Key West's well-known and yet-to-be-discovered artists. As the sun goes down Duval Street is the place to be for fabulous seafood, eclectic shops and carefree night life. An oasis of natural tranquility, the Key West Tropical Forest & Botanical Garden is the only frost-free tropical moist forest garden in the continental United States. Pirate Walking Tours of Old Key West. Listen to never-before-told-tales-of-piracy as you stroll through the streets of Key West! Take a leisurely tour of Key West on the historic Conch Train. Come Walk on Water in Key West! Often ranked amongst the the best beaches in the USA, the Bahia Honda Beaches, just a short drive from Key West, make up a 524-acre State Park. Contemporary and fresh in a lively section of Key West next to Mallory Square. Historic hotel full of old Hollywood glam, right on the beach. Lovely bit of natural beach on a quiet stretch of Duval Street.